Two bills have been introduced to the state’s legislature to curb protests against what the state calls critical infrastructure, including systems related to utility services, fuel supply, energy, hazardous liquids, natural gas, or coal. Both bills are not limited in scope, encompassing conspiracy elements extending to all areas where cyber security may be an issue, including oil pipelines, oil extraction, and relevant private companies. Senate Bill 2209, has been introduced to expand concealment of all records from the public related to utility projects, while Senate Bill 2044 targets individuals caught interrupting or impairing a critical infrastructure facility, or the organizations called “conspirators” involved, facilitating an automatic felony penalty. Three people spoke in opposition to SB 2044 in a room packed with oil and energy lobbyists last week. “If North Dakotans care about their homes and their children they will stop these bills. There is no time to waste,” Michael Foster, an activist known as a valve turner said about the bills. Foster was recently paroled from a three-year-prison sentence for his involvement in shutting down the Keystone Pipeline for eight hours in 2016. 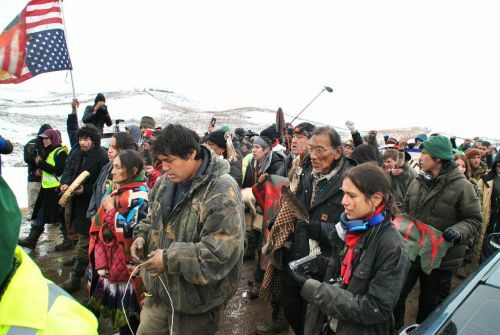 His action – which included eight others – was considered the biggest coordinated move on U.S. energy infrastructure undertaken by environmental protesters. He helped halt 15 percent of U.S. oil consumption for the day. Keystone employees called Foster a terrorist; environmentalists named him a hero. The stress of fighting an uphill battle against “big oil” is grinding him down, he said. He plants trees as his medicine. “The only thing that we take more serious or sacred than our own survival is patriotism, so if you make burning oil and gas patriotic then we don’t stand much of a chance really, because our survival depends on not burning oil and gas,” Foster said. The time to slow or halt oil extraction and pipelines is already past, Foster said. 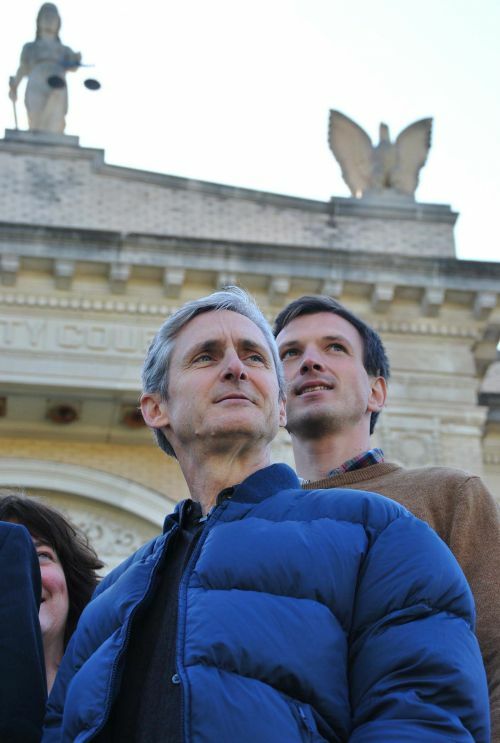 He is a former mental health counselor turned activist, working with environmental groups such as the Mosquito Fleet Rapid Response Team and Al Gore’s Climate Reality Project. On Black Friday 2018, President Donald Trump’s Administration released a federal report warning that climate change could soon imperil the American way of life and harm the health of nearly every citizen. Trump was reported saying he didn’t believe the scientists behind the report, and released the information on the nation’s busiest shopping day to escape headlines, according to analysts and professors. Such disbelief is what spurs Foster to continue his fight for the environment, he said. “If people want to preserve their homes, their families, their lifestyle in North Dakota in anything resembling anything we have today, it is not enough to merely diversify North Dakota’s economy,” Foster said. “It is not enough to learn how to be self reliant, or grow your own food, or get off the grid. The citizens of North Dakota will need to shut off the industry that is powering the economy there. 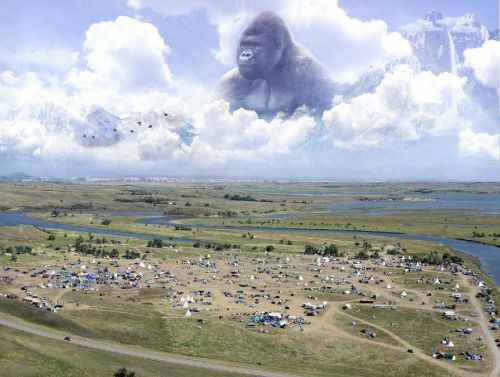 Foster’s name was brought up during the hearing pertaining to SB 2044, Elizabeth Loos, the legislative coordinator for the North Dakota Human Rights Coalition, said. Mary Wilson, from Fort Yates, who was employed at Standing Rock for 15 years and currently works at the Water Protector Legal Collective in Bismarck, attended the hearing for SB 2044 and ended up testifying against it. 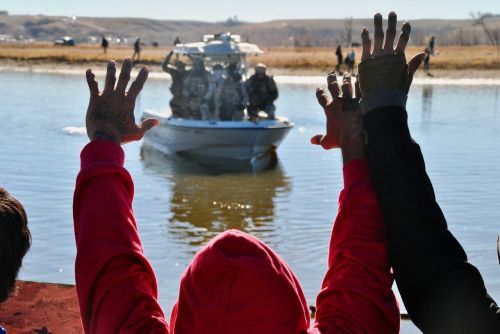 During trials for the more than 761 people arrested during the DAPL controversy, judges frequently told prosecuting attorneys to have the state legislature define the meaning of the term “tampering” with a public utility. Frances Madeson, of the Water Protector Legal Collective, spoke on her own behalf about the bill. 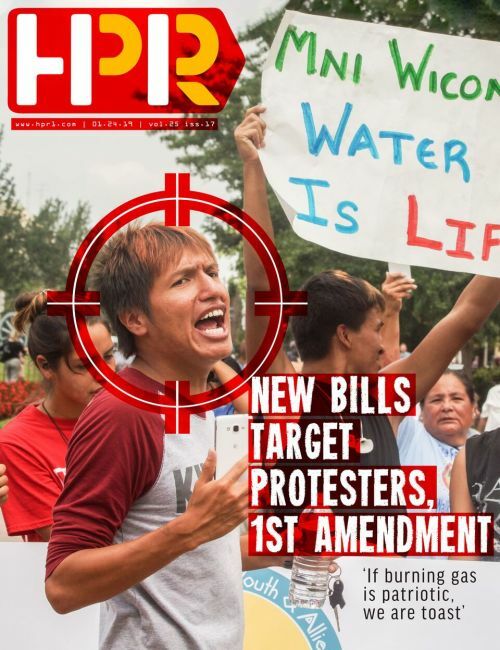 Jeff Haas, a published author and civil rights lawyer going back to the People’s Law Office in Chicago, also jumped on board with the Water Protector Legal Collective. He has been keeping careful watch over the bills introduced by the 66th State Legislature, and found connections to ALEC, or the American Legislative Executive Council, a right-wing entity that lobbies for fossil fuels and border restriction bills among other conservative legislation. “I suspect that there are ALEC members in the North Dakota legislature, and they’ve picked up this bill and I think the bill does three main things: expands the definition of infrastructure, it vastly increases the penalties of those protesting against or cause any damage to infrastructure, and it includes a conspiracy clause,” Haas said. “I think it’s really an attempt to inhibit support of people who are opposing pipeline development on the grounds of whether it’s interfering with sacred sites, or threatening the water supply, or dealing with the sovereignty of Native lands. Former Green Party Presidential candidate, Jill Stein, pleaded guilty of the exact offense in 2017 for “tagging” a DAPL bulldozer, a misdemeanor. If the bill is passed, an individual would face felony charges, which can lead to five years in jail. Additionally, the bill’s definition of infrastructure is far too vague and broad, he said. The ACLU of North Dakota also spoke against the bill. 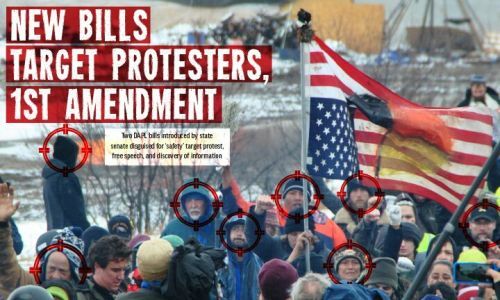 “Senate Bill 2044 punishes association, and will almost certainly stifle protected speech,” Heather Smith, executive director of the ACLU of North Dakota, said. “It would criminalize activity far beyond the intentional causing of property damage, extending penalties to activity such as ‘interfering with’ or ‘inhibiting’ the operations of critical infrastructure, terms so vague as to be nearly meaningless and criminal penalties may be imposed without evidence of any intent at all. This is unconstitutional. Smith also said that the bill would punish organizations “conspiring” with individuals found to be in violation of the new prohibitions and fined ten times over. Making an organization criminally liable for all damage would impermissibly burden the rights of political association that are protected by the First Amendment – the literal embodiment of guilt by association. Scott Skokos, executive director of the Dakota Resource Council, pointed out during testimony that the bill for SB 2044 came from ALEC-proposed legislation, and not from a year of research like some sponsors claim. 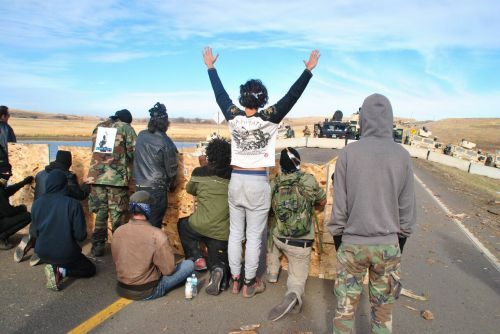 Legislation for the bill is being pushed by special interests to protect “specific types of infrastructure and to chill protest,” the Dakota Resource Council posted to its Facebook page. The bill is a direct assault on the First Amendment, Skokos said during testimony. North Dakota Newspaper Association Executive Director Steve Andrist said both bills are bad policy, but that SB 2044 is worse. “It primarily exempts safety and security plans of critical infrastructure, which in most cases seems reasonable,” Andrist said. “It’s unnecessary and an attempt to chill free speech. All of the things it specifies as illegal already are illegal. In addition, the section holding organizations responsible for what their members do is probably unconstitutional. This simply is not good policy.” Related to the unconstitutionality of SB 2044, other legislative proposals have caught the newspaper organization’s attention. According to SB 2209 co-sponsor, Joan Heckaman, a Democrat from New Rockford, such legislation will ensure agencies and stakeholders that their security plans are secure, she said. Heckaman said that cyber security threats are increasing daily, even in North Dakota. But the law, as written, would apply to more than schools. 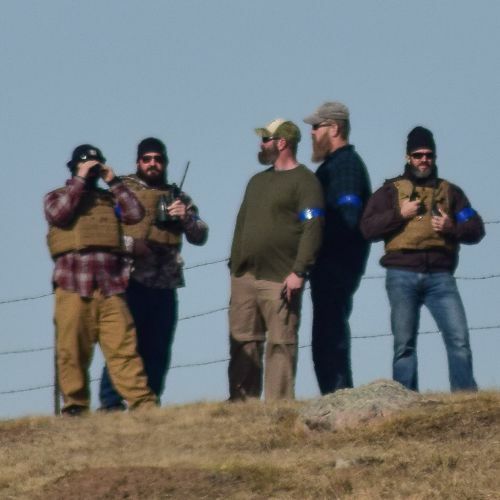 Cyber attacks occurred during the DAPL controversy, but so far, no one, including all law enforcement agencies involved and private security companies such as TigerSwan have either denied using such techniques, or refuse to answer questions. Cyber security laws, including digital warfare techniques, are a legal grey area due to the inability of the government and the courts to keep up with the ever-changing sector. Information pertaining to cyber attacks, including those used during the months-long No-DAPL controversy, has so far been impossible to uncover. The disclosure would include all agencies involved with “critical infrastructure,” meaning all physical and virtual public buildings, systems, telecommunications centers, computers, power generation plants, dams, bridges, and systems related to utility services, fuel supply, energy, hazardous liquid, natural gas, or coal, according to the proposed law. The information being protected would also include cyber security defense, threats, attacks or attempted attacks, according to the new law. While the new information may look harmless with a cursory glance, and necessary for some organizations, the legal fog surrounding the protection of such information has many worried of government overreach or First Amendment abuse. If a government can operate completely within the shadows, where would the oversight come from? Questions Haas would like to uncover include: Who are the sponsors behind HB 2209? Is it Energy Transfer Partners? Is it private security organizations? “This bill had to come up specifically and seems to be a reaction to the North Dakota situation, and the situation between private security and government,” Haas said. 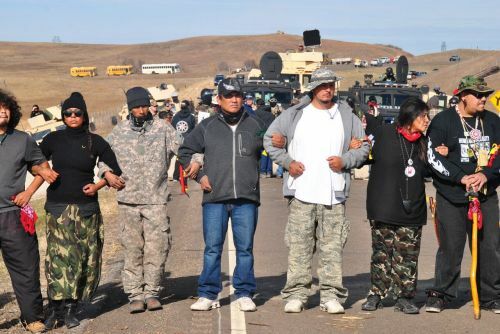 Energy Transfer Partners, the parent company behind the Dakota Access Pipeline, hired private security firm TigerSwan and other private security organizations in 2016. According to information discovered by The Intercept and the High Plains Reader, law enforcement was working closely with the private security firms to coordinate attacks, infiltrate the camps, disseminate propaganda, and control the narrative. Some information should be kept secret, but the line between operating in the shadows and full disclosure is thin. “This is an area where a court could easily weigh the risks – some pieces of information could threaten the security of infrastructure, but others are not important. For instance, how many people did TigerSwan have? How many infiltrators in the camps? How many were provocateurs? This is information that does not threaten infrastructure. During the DAPL trials, the Water Protector Legal Collective conducted jury surveys across the state. Fargo was almost as derogatory about the activists as Bismarck and Mandan, Haas said. The Bakken oil field may be a silver bullet for the economy, but the short term gains pale against the long-term effects to climate. The bill that aims to increase penalties for interfering with a critical infrastructure facility, such as an oil pipeline, will not act as a deterrent, Foster said. “As far as this bill goes it’s not going to make any difference,” Foster said. “For people like me who sees everything we love at risk, risking life in prison or some terrible fine is not going to stop us. There is no price that you can put on life on earth. “That’s the whole point of why we did what we did. When I was charged they threw 81 years of charges at me. We knew going in as we were planning this that it was something we were committing our lives to. And it felt like a very, very small price to pay if it could make any difference, inspire anybody to do something urgent, do something big, do something meaningful, and stop polluting. The state legislators sponsoring SB 2209 include: Senator Jerry Klein, a Republican from Fessenden and a member of ALEC Commerce, Insurance and Economic Development Task Force, Senator Joan Heckaman, a retired teacher and a Democrat from New Rockford, Senator Janne Myrdal, a Republican from Edinburg and a member of ALEC Rural Caucus and ALEC Energy, Representative Chuck Damschen, a Republican from Hampden who signed an ALEC Action letter in support of appointing Judge Brett Kavanuagh to the U.S. Supreme Court, Representative Bill Devlin, a former newspaper publisher, past president of the North Dakota Newspaper Association, and a Republican from Finley, and Representative Rick Holman, a Democrat from Mayville. Those supporting SB 2044 include: Senator Janne Myrdal, who temporarily posted an article featuring a "gay Nazi flag" to her Facebook in 2017, Senator Jessica Unruh, a Republican from Beulah, Senator Dave Oehlke, a Republican from Devils Lake, Representative Jim Schmidt, a Republican from Huff, and Representative Chuck Damschen, a Republican from Hampden. Unruh replied only to say she didn’t want to comment on her support of the bill. Last year Unruh reportedly gave Trump a “Make Coal Great Again” hat saying wind production has eroded the state’s tax base and replaced coal when it comes to electricity production, according to Politico. 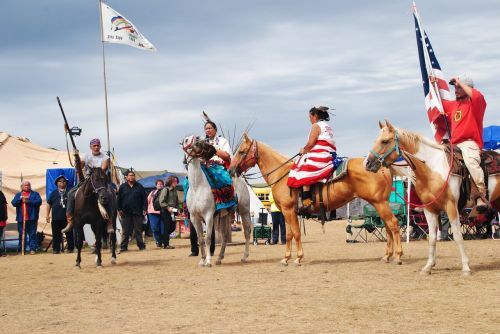 In June 2018, Unruh also published an opinion piece entitled “Celebrating One Year of the Dakota Access Pipeline” on Rob Port’s Say Anything Blog. Foster celebrated the one-year anniversary of the Dakota Access Pipeline behind bars, and sees the state’s dependence on oil as a danger to society. “North Dakota oil is flooding the market,” Foster said. “North Dakota oil is the only oil we don’t talk about capping. North Dakota oil unlike OPEC, unlike Russia, you will never hear about capping production. Why the f*ck are we free to produce as much as we can to make the other largest players in this commodity – that we all over abuse – why are we the ones forcing OPEC and Russia to limit production just so that North Dakota oil companies cannot go bankrupt?